Make sure your first meeting with your child’s teacher is productive; our suggested questions (plus some things you might want to share) will help. Children can keep track of their growing libraries by identifying their books with a personalized nameplate. Two bookplates (one each of two designs) print on a letter-size page. It can be printed on a full-sheet label or on any paper of your choice. After printing, cut out the individual bookplates, write in your child’s name, and press or paste inside the book. Don’t forget a thing! 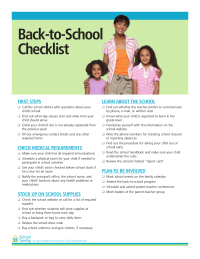 This comprehensive printable checklist will help make sure all your i’s are dotted and t’s crossed before your child’s first day.